Can I view system stats in the Terminal? 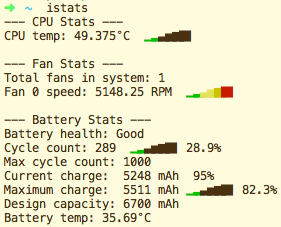 How can I view such system stats in the Terminal? Most of these commands have a huge list of options, it's probably best to consult the man pages for details. I usually rely on top -u -s 10 to identify CPU-hogging processes and fs_usage -f filesys/fs_usage -f network to identify processes generating a lot of disk/network load. You can use top. It'll show CPU & RAM usage together with all the processes. It'll also show you network packets in/out, and discs data read/written. To show how much disk space all the folders below my current directory are using. If you are having network problems, especially with a server exposed to the Internet, lsof(1) can be extremely useful. It lists all open files. For example, lsof | fgrep '/Library/WebServer/ will show you all the files that are open on your web server. I've been using this a lot to find and ban "leeches" and "bots" who are reducing my bandwidth by automatically sucking down file after file. -ax: all processes, including non-terminal processes and ones you don't own. -o pcpu: only output the %cpu field. %cpu is a 1-minute average of the process, but will only average over the lifetime of the process if its lifetime is <1min. awk: sum the first column in each line and print the sum at the end. This is a per-core CPU metric, so on a 12 core CPU you can get up to 1200; you're not capped at 100. This is when using Wi-Fi. For ethernet use en0. Does anyone know a decent app to monitor bandwidth usage, ideally from the terminal?